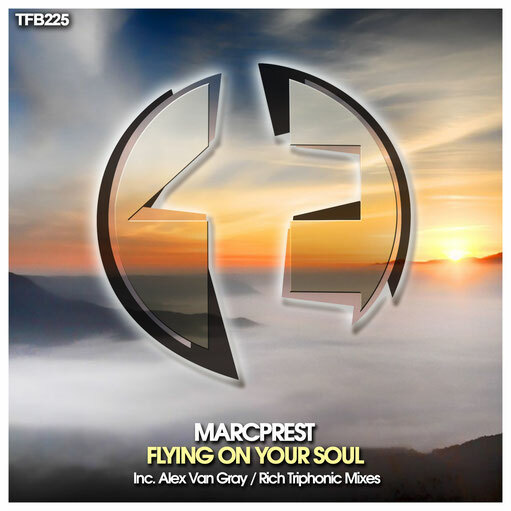 TFB Records is proud to present its brand new release, number 225, with the stunning original song produced by Marcprest, 'Flying on your Soul'; including two additional marvelous remixes by Alex Van Gray and Rich Triphonic. A vast power welcomes us into the original song and, as the uplifting special touch is added, we surf an incredibly magical initial path. After such a beautiful progression, the breakdown comes in to end up blinding us with an incredible amount of peaceful sounds. The beauty and the harmonic essence released within this break is just undescriptible, it reminds us how often the emotional music is misunderstood, cause it may not fit well into a main stage set but, what is far more important is the feelings it conveys to us, making us to instantly teleport our mind to the world of wonders. What music makes you feel is what really matters so, we highly recommend you to listen carefully to this impressive song and feel the experience. Flawless gem by Marcprest, thanks buddy! Alex Van Gray has taken one step forward into the most characteristic uplifting sound, imprinting higher energy to his remix. But, what surprises us is the way he has kept the mystical essence, combining in such a perfect way both faces. It trully shows impressive production skills on creating an emotional anthem with the exact amount of power within its baseline, totally awesome. When we fall into the breakdown, the unexpected story starts again, taking us to a different place everytime we listen to it; this is the true magic of Trance music. The journey is even enhanced with the blinding climax, where the baseline fully meets the whole melody, a completely mystical experience for our mind. Alex Van Gray proudly brings to us a song worthy to be among the best emotional uplifted tunes of the year! Congratulations Alex! Closing this release we find the remix signed by Rich Triphonic, a huge talented producer who is quickly rising to the top level of producing. From his particular point of view, he presents a song with a slightly darker baseline, giving to it a higher leadership during the initial progression of the song, letting the first glances of the melody to float above it. The breakdown comes in very subtly, arising the melody to its highest point and letting it shine with all its beauty. But the tension starts to be gathered soon, rising the whole energy progressively until the red line is crossed and what comes after is for you to discover.